The Royal Window in Canterbury Cathedral, c.1482. 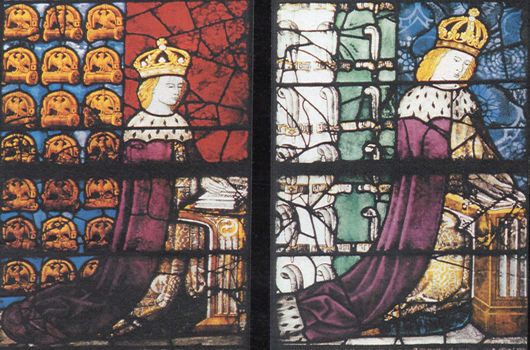 Due to damage and neglect, much of the original glass was replaced during the 18th and 19th centuries, including the heads of the sons of King Edward IV. Sadly, it seems that these later restorations did not remain faithful to the original 15th century depictions. Image: courtesy of Geoffrey Wheeler, Richard III Society. Who were the Missing Princes? The Missing Princes were the sons of King Edward IV of England - Edward V (12) and Richard, Duke of York (9). Both boys disappeared from the royal palace of the Tower of London sometime during 1483-4 where they had been placed by the King’s Council in preparation for Edward’s coronation in June 1483. However, following the revelation of their father’s secret marriage to Eleanor Talbot, the children of King Edward IV were declared bastards by the Three Estates of the Realm and, under medieval Canon Law, were ineligible to succeed to the throne. As the next legitimate heir, their uncle, Richard, Duke of Gloucester, was petitioned to become king. Richard III was crowned at Westminster Abbey on July 6 1483. Shortly afterwards, Richard embarked on a Royal Progress of his new kingdom heading northward to Yorkshire. It was while Richard was absent from the capital that the sons of Edward IV apparently disappeared from the Tower of London. Contemporary sources confirm that the boys were alive in the Tower while Richard was on progress, and some say that they were alive on or around 8 September when the King was in York (Croyland and Vergil). However, by late September, rumours of their death were seemingly spread by rebels in the south led by Richard’s royal cousin and former ally, Henry Stafford, Duke of Buckingham. Why do we need a Missing Princes Project? Put simply, it is to help move our knowledge forward and to attempt to finally come to a definitive conclusion about this enduring royal mystery. The Looking For Richard Project, which discovered Richard III in a car park in Leicester, succeeded because it was prepared to question, rather than simply repeat traditional history. It examined the age-old ‘bones in the river’ story and proved it false. It also introduced science and a multi-disciplinary approach to the study of history: Dr John Ashdown-Hill’s ground-breaking discovery of the king’s mtDNA, and my decision to commission a GPR survey, archaeological dig, and the first-ever Psychological Analysis of Richard III by two of the UK’s leading experts. This new multi-faceted approach is now leading the way for future historical investigations. The strategy is unequivocal; only by questioning received wisdom and dogma can we hope to move our knowledge forward, to learn and to discover. The discovery of Richard III has exposed many of the myths surrounding this historical figure so that today he is increasingly discussed within the context of his time. This is an important development. Although Richard is a uniquely controversial figure, many commentators through the centuries have merely nailed their colours to the mast of the Tudor portrayal, so that the study of our history remains replete with blind repetition. The preferred route for many is to repeat as fact the rumour, hearsay and gossip proclaiming not only the certain deaths of the Princes within the Tower of London, but also Richard III as the indisputably guilty perpetrator of the crime. All this despite the fact that there is no evidence whatsoever to support either their murder in the Tower, or the king’s culpability. But might it be true? What little evidence we do possess suggests it is unlikely, but The Missing Princes Project aims to question and leave no stone unturned. The ‘murder’ of the ‘Princes in the Tower’ is the enduring mystery that continues to divide opinion and feed the centuries-old debate of good or bad Richard, which ultimately serves only to remove us from the real, the historical. By questioning traditional history and launching this unique investigation we hope to discover the key to one of our most enduring historical mysteries. And by finding the truth, we may finally be able to lay King Richard III - the medieval man and monarch - to rest. How do we hope to achieve it? The Missing Princes Project is a Cold Case History investigation employing the same principles and practices as a modern police investigation, and this is what is new. It is not an academic study or exercise although it does naturally involve the examination of all contemporary and near contemporary source material, but it is in its intelligence gathering and modern investigative methodology that offers an exciting opportunity and a new 360 degree approach in terms of this abiding mystery. The modern investigation is employing forensic analysis of the people and events surrounding the disappearance of the sons of Edward IV to open exciting new lines of investigation. At the same time, the project is initiating searches for neglected archival material in the UK and overseas. The term ‘missing’ is applied to the project because this is all we know about this mystery based on the available evidence. The Missing Princes Project is, as a result, a Missing Persons Investigation; albeit one that is 500 years-old. The project requires a wide range of skillsets, from specialist modern investigative expertise to Palaeography, Latin and key foreign languages such as French, Flemish, Dutch, German, Spanish and Portuguese. One of the most important aspects of the project is the local initiatives aiming to draw attention to little-known archival material. We believe that new documentary evidence is waiting to be discovered but we require willing volunteers in the UK and overseas. Once located a team of specialists is ready to help. Does your local library or local authority hold any uncatalogued records, is there a local archivist willing to help, or is there a collection of records held by a local family who might allow one of our experts to examine them? If you would like to help with a search for neglected archival material in your area, then please complete the Confirmation of Interest form. Is it possible to solve the mystery of the Missing Princes? When I began the Looking For Richard Project it was derided by many within the academic and historical communities as a nonsensical wild goose chase. Many traditional and supposedly authoritative accounts published before August 2012 clearly testified that the remains of Richard III were in the river Soar. But disparagement in all its forms does not, and must not, change or stop what we do. The Missing Princes Project was launched in the summer of 2015 with three new lines of investigation. By early 2016 these had developed into twelve. The project currently has thirty-five separate lines of investigation, which, to my knowledge, have not been investigated before. ** It looks likely to be a mammoth task, potentially taking many years but nothing worth doing is easy. The Looking For Richard Project took ten years to reach its eventual conclusion with the honourable reburial of King Richard III. Whatever the task ahead of us, what is important is that for the very first time, we are looking. **December 2016 Update - The Missing Princes Project now has 75 lines of investigation. ** January 2019 Update – The Missing Princes Project now has 111 lines of investigation, with over a third of these (39) in active research. By way of an example, a search for the project is now taking place in the local authority archives in Grimsby in Lincolnshire, led by Sharon Lock, Communications Manager at the Richard III Society. 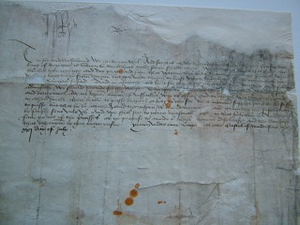 Sharon has uncovered a letter from Henry VII. This gives us an insight into just how worried Henry VII was about the invasion of the supposed pretender, ‘Perkin Warbeck’. Sharon had no idea that this letter existed in her home town. As a result, she has now discovered that there are other medieval documents in the archives as yet uncatalogued and waiting to be transcribed. This could be a common occurrence around the UK and overseas and we should never assume that everything known has been discovered. Research is also in progress at Maidstone Library Archives in Kent led by Jean Clare-Tighe, a member of the Richard III Society. Jean has uncovered a curious letter from Richard III. Whilst searching for documents at the local archives in Maidstone relating to Thomas Bourchier, Cardinal, and Archbishop of Canterbury for The Missing Princes Project, Jean came across documents held there on behalf of Sandwich Borough Council. During medieval times Sandwich was a significant English port and the main Kent port situated on the River Stour. With this in mind Jean thought their records would be worth looking into and she uncovered a copy of a letter written by Richard III to the Mayor of Sandwich, bearing the king’s sign manual. The letter is dated 13th December. Although the year is missing, analysis of 1483 and 1484 along with the key months following the rebellion of the autumn of 1483, make the earlier year a much more likely candidate, particularly when it is known that King Richard visited Sandwich for a number of days the following month (13-17 January 1484). There was also some doubt cast as to whether this was Richard III’s signature, but this was laid to rest for Jean by Dr Heather Falvey, a specialist in Palaeography at the Richard III Society. Heather explained that the clerk had copied the contents of the original letter, including the signature. 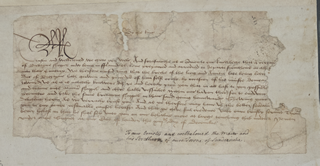 It is interesting that King Richard has written quite a detailed letter, but there is clearly something that he does not want to disclose in writing, but has instructed his servant to convey it verbally to the Mayor. His trusty servant, Thomas, has not been given a surname. It could be that by giving his full name conclusions may have then been drawn as to the nature of the additional (and potentially important) information he carried, and to the king’s intent. ¹ That is ‘bearer’, i.e. Thomas brought the letter to Sandwich; his surname is not given. What was the information his trusty servant Thomas was carrying to the Mayor? Perhaps Jean may uncover more during her searches of the Kent archives. With thanks to Dr Heather Falvey of the Richard III Society. In 2012, Philippa Langley led the search for Richard III in a council car park in Leicester through her original Looking For Richard Project. Philippa conceived, facilitated and commissioned this unique historical investigation. Following seven and a half years of enquiry, she identified the likely location of the church and grave, instructing exhumation of the human remains uncovered in that exact location. Her project marked the first-ever search for the lost grave of an anointed King of England. She is President of the Scottish Branch of the Richard III Society and in 2015 was awarded Membership of the Most Excellent Order of the British Empire (MBE) by HM The Queen at Buckingham Palace.